AFTER almost the obligatory blip at the end of December, Albion’s Championship campaign is very much back on track. Back-to-back home wins, against Brentford and Bolton respectively, was followed by Tuesday night’s hard-earned point at top-of-the-table Hull City, leaving the Albion third in the table and still very much in the hunt for automatic promotion. Top quality saves at vital points in the last two games have pushed Albion keeper David Stockdale to the forefront, on current form throughly deserved but almost somewhat ironic given the previous opinion on the player from a section of the support. 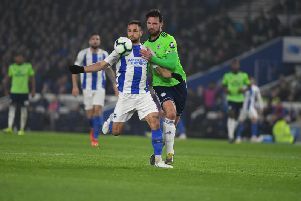 The Albion bandwagon now moves away from the Amex for back-to-back away games at Cardiff and Bristol City, on Saturday and Tuesday respectively. With the Bluebirds on the extreme periphery of the play-off picture and Bristol City fighting relegation, it’s again a real challenge for the Albion. Personally, if they return from the South West on Tuesday night with four points from both games that will represent an excellent haul and keep up the promotion momentum. Next week could also possibly see the end of the return of Glenn Murray saga. If the former Albion marksman were to sign on loan from Bournemouth for the regulation 93 days, that would cover all of the remaining league matches and the three potential play-off matches. It appears that almost everyone has a theory on this story. For my part, the source it came from has been very reliable over the years. The loan represents a great piece of business by the club, quite simply if he were to stay injury and suspension free, Murray, given the relevant game time, will score goals – goals that could help get the Albion into the Premier League next season. But will he come ‘home’ next week? We will have to wait and see but, once again, it’s certainly never dull supporting the Albion. n It was possibly a slow news day on Tuesday but the BBC Sport website report about the possible health risks of 3G pitches had previously been in the tabloid press some weeks ago and was, in parts, factually incorrect. However emotive the issues raised in part of the story, and I, like everyone else have the deepest empathy for the people involved , it has no relevance to the facility at Worthing Football Club. The contractors hired by George Dowell to install the pitch at Woodside Road adhered to all the relevant regulations and safety standards. This is backed up by a detailed report and subsequent testing by the Football Association, on all the new surfaces installed over the last few seasons. On the pitch, while it’s league action away to South Park this weekend, next Wednesday’s Sussex Senior Cup semi-final showdown against Whitehawk at Lancing has certainly whetted the appetite of the local footballing public. A real test for the Rebels, but one they will certainly be up for, and a large contingent of Worthing support at Culver Road will be testament to that.